Nativity 8 pieces for creche traditional colours 19 cm. Mary for creche traditional colours 19 cm. 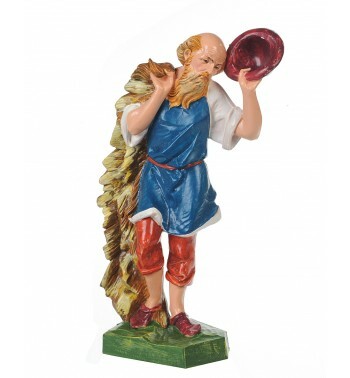 Saint Joseph for creche traditional colours 19 cm. Child and crib for creche traditional colours 19 cm. Child for creche traditional colours 19 cm. Ox for creche traditional colours 19 cm. Donkey for creche traditional colours 19 cm. King (302) for creche traditional colours 19 cm. King (303) for creche traditional colours 19 cm. King (304) for creche traditional colours 19 cm. Glory angel for creche traditional colours 19 cm. Standing angel for creche traditional colours 19 cm. Kneeling angel for creche traditional colours 19 cm. King on camel (1) for creche traditional colours 19 cm. King on camel (2) for creche traditional colours 19 cm. King on camel (3) for creche traditional colours 19 cm. Shepherd (315) for creche traditional colours 19 cm. Shepherd (316) for creche traditional colours 19 cm. Shepherd (317) for creche traditional colours 19 cm. Shepherd (318V) for creche traditional colours 19 cm. Shepherd (320) for creche traditional colours 19 cm. Shepherd (321) for creche traditional colours 19 cm. Shepherd (322) for creche traditional colours 19 cm. Shepherd (323) for creche traditional colours 19 cm.